We have a collection of Kwanzaa crafts for you to enjoy, inspired by traditional African handicrafts and the colours of Kwanzaa - red, green and black. This handprint kinara makes a quick, fun and messy Kwanzaa craft for kids!. 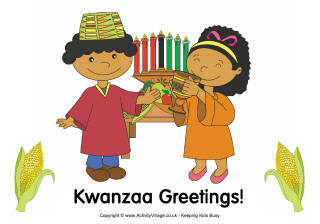 Every family celebrating Kwanzaa displays a kinara, a candelabra for 7 candles representing the seven days of the Kwanzaa holiday and the seven principles of Kwanzaa. Each night a particular candle is lit.